Recently we went to UKNOF where Alcatel Lucent gave a helpful presentation on new ethernet speeds. Currently most network connectivity is 1Gbps ethernet over Cat5e copper which stretches up to 100m. There is an infrequently used standard for 10Gbps over Cat6 copper to 55m for higher speeds. Now demand is starting to appear for faster than 1Gbps speeds, and it’s very attractive to do this without replacing the installed base of Cat5e and Cat6 cabling. There are new standards in the pipeline for 2.5Gbps and 5Gbps ethernet over Cat5e/Cat6 cabling. In the data centre it’s common to have 10Gbps over SFP+ direct attach for short interconnects (up to 10m) and 1Gbps/10Gbps/40Gbps/100Gbps over fibre for longer distances. 1Gbps and 10Gbps are widely adopted. 40Gbps and 100Gbps are a different design, implemented by combining multiple lanes of traffic at 10Gbps to act as a single link. 100Gbps has changed to be 4 lanes at 25Gbps rather than 10 at 10Gbps. The more lanes you have in use, the more switches and switching chips you need – but effectively this means that 40Gbps has the same cost in port count as 100Gbps. The next generation of 100Gbps switching hardware will consist of a large number of lanes that run at either 10Gbps or 25Gbps. With current interfaces, you’d use 4 lanes for 100Gbps, 4 lanes for 40Gbps or 1 lane for 10Gbps. The obvious gap is using a single lane for 25Gbps standard so you can connect vastly more devices at greater than 10Gbps speeds. So in the near future, we’re expecting to see 2.5Gbps and 25Gbps ethernet becoming available, and in the longer term work has now started on 400Gbps standards. Stormy weather, the clouds are growing. 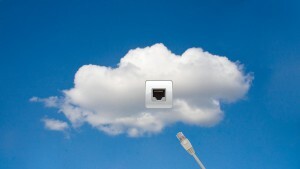 A customer of ours has been extending their private cloud. This adds another 160 cores, 160Gbps, 2TB of RAM and over half a petabyte of storage. 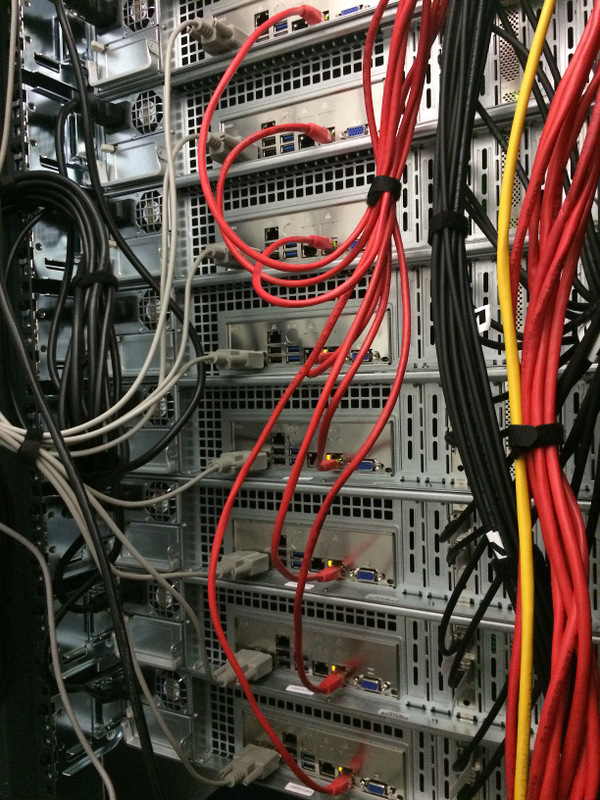 On the left you can see the black mains cable, then the serial for out of bound configuration, then red cabling for 1Gbps each to our main network, then 20Gbps per server to the very secure private LAN on SFP+ direct attach. The out of place yellow cable is network for the serial server above, and the out of place black one is serial to the 720Gbps switch which isn’t quite long enough to route neatly. There’s a few more bits and pieces to add, but soon it will join their OpenStack cloud and substantially increase the rate at which their data gets crunched. Taking a break from our usual articles about upgrades for VPS customers and mocking the hopelessly incompetent, we’d like to announce an upgrade for dedicated and colo customers in our Cambridge data centre. We’ve finally completed the upgrade of both of our links into Cambridge, so have increased bandwidth quotas, and reduced excess rates to just 7p/GB. 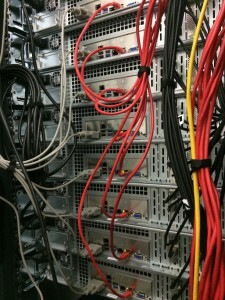 Details of the new specs can be found on our Dedicated Server, Colocation and Mac Mini Colo pages. 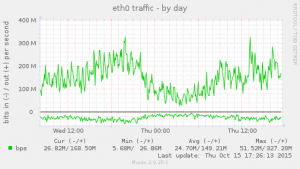 We’ve been adding some more peering sessions to improve our network redundancy. We already had direct peering with every significant UK ISP, we’ve now enhanced this so that one peering session terminates at one of the Telehouse sites, and the second terminates at one of the Telecity or Equinix sites. Each peering session is on a different London Internet Exchange (LINX) network which are physically separate from each other, and where possible we’ve preferred peering sessions that remain within a single building. We have equal capacity on both networks at LINX, so unlike many ISPs with a single peering port or unequal capacity, in the event of a severe failure (e.g. a whole network or data centre) we just automatically migrate our traffic to our other peering link, rather than falling back to burst bandwidth with our transit providers. We feel that’s a risky strategy because failures are likely to be correlated, lots of ISPs will fall back to transit all at the same time in a badly planned and uncoordinated fashion which could cause a huge traffic spike upstream. We light our own fibre ring around our core Docklands data centres, and have full transit and peering at both of our core POPs, with dual routers in each, and can offer full or partial transit at any of our data centres. Some ISPs have started to report that their IPv4 routing tables now exceed 512k individual routes. At present we’re only seeing 502k routes but we’re nearly there. Some ISPs will just drop some IPv4 routes, or cease processing updates, which means gradually odd bits of the internet will cease to work. Some ISPs may fall into a software routing mode reducing in reduced performance. Some ISPs will rely on filtering to reduce the routing table in size by aggregating routes together. Some ISPs will alter their configuration for Cisco CAT6500 routers and disable IPv6 in order to increase the memory available in their routers for IPv4. So watch out for oddities, and expect them to occur more and more frequently as the growth in the routing table gradually reveals which ISPs are running into trouble having not planned ahead. Normally a server has a globally unique IP address, and the Internet knows how to send traffic from any other machine in the world to that IP address. With Anycast we share a single address across multiple machines, and your traffic is sent to the nearest machine with that address. This means that UK customers can be answered from a server in the UK and Australian customers from a server in Australia allowing you to have very fast responses to things like DNS queries because you’re always served by a server that’s close by, rather than your query having to travel half way around the world. To set up an Anycast network, you need your own address space, your own network number (ASN), multiple BGP-aware routers that can announce your address space, and multiple servers that can answer the queries. Typically this would require a pretty hefty budget, but if you’re Nat Morris and you know what you’re doing with software routing on Linux, and you know all the right providers then you can bring up a global Anycast network with 10+ servers and sites on an annual budget of well under $1,000. The key to doing this is finding ISPs, ideally well-connnected ISPs in key internet hubs, who will provide you with a BGP feed to your hosted server. That’s where a UK clueful hosting company comes into the picture having excellent connectivity, inexpensive virtual machines (VMs) and a willingness to support customers with more unusual configurations. which says that to get to anywhere on the internet, send packets to our router at 93.93.128.1. For every block on the whole internet you have a different gateway depending on what you’ve decided is the preferred route. At today’s count this is about 490,000 entries in the routing table. Don’t type ‘route’ if you’re logged in over 3G! So for this VM, instead of having a default route, Nat has four full BGP sessions, two to each of our two routers to the site. On each router, one session provides 490,000 IPv4 routes, the other provides 18,000 IPv6 routes, and the VM gets to decide which router to send data to. The other side of the BGP relationship, and the important bit for Anycasting, is that we receive an advert from Nat’s VM for his /24 of IPv4 space and /48 of IPv6 space, which we then advertise out to the world. The 10+ other providers in this Anycast setup will do the same, and hosts will direct traffic to whichever is nearest. As Paul Vixie pointed out in the first question to Nat, the main customers of VMs with BGP are spammers who hijack address space for nefarious usage. At Mythic Beasts we filter our announcements and our customer routes, so if Nat messes up his configuration and accidentally announces that his VM is responsible for the whole of Youtube we’ll drop the announcement rather than expecting one very small VM to handle one fifth of the internet. If you’re a DNS provider or a content delivery network, you’ll probably want to have an Anycast setup at some point. 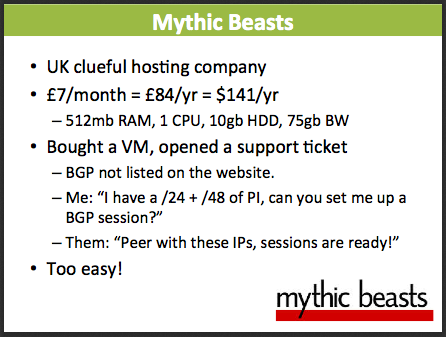 At Mythic Beasts we remember what it was like to be the little guy which is why we offer full BGP routing (including IPv6 BGP) as an option to any virtual server, dedicated server, colocated server or router. Providing you own your own ASN and IP space we can transit it for you and we can keep the start-up costs very low and scale with you. You can locate your VM or server directly with us in Telecity, mere tens of metres from LINX and LoNAP for minimal latency and maximal available bandwidth. If you’ve no idea what an ASN, BGP, LIR, RIPE are, we can help arrange your ASN, IP space and BGP config. Router fails, no packets dropped. This morning one of our routers in our Cambridge data centre stopped reporting bandwidth data to our billing system. We investigated and whilst it was still routing packets without issue, it appeared to be experiencing hardware failure. We’ve powered the router down, pending full investigation on our data centre visit this afternoon. Currently all traffic from our Cambridge site is being handled by our other router. This seamlessly failed over with no customer impact. Depending on your choice of terminology ‘Redundancy has been reduced to N’, or ‘The network is at-risk’. In Mythic Beasts we like to speak English so this translates to, if something else fails before the router is restored to service, there is a risk of a network outage to our Cambridge data centre. Update : Friday 31st we fully restored our network to it’s usual redundant configuration by replacing the router with a similarly over specified replacement. Customers may have received free bandwidth for some of this period.